Burnt Helmets take 2nd at North Bay Triathlon! 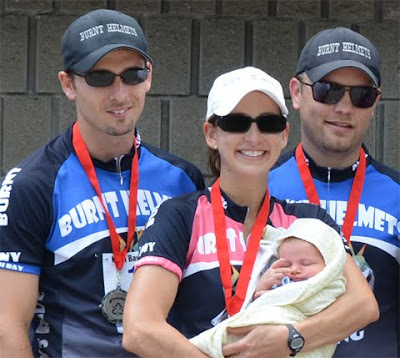 Well, the Burnt Helmets took 2nd place in their category (mixed relay) at the 2011 edition of the North bay Triathlon. You can see complete team relay results here. Amy, after giving birth to Nolan just seven weeks ago, was less than 2 minutes off her previous time from 2009. Dave continued his trend and steam rolled much of the competition going up Lee's Road. The bike route has changed since 2009 so not much more in the way of comparisons can be done, but Dave maintained an incredible high tempo with an average speed of 31.8 km/h. Denis trained hard this year, including changing his running style to better improve his efficiency. As the run route is now recorded as being 8.4 km comparisons with Denis' previous times aren't possible - however, the training appears to have paid off with Denis' dropping 1 second off his pace thus improving his time overall. Hat's off to the Burnt Helmets for the 2nd place finish. Summer's here - so its time to enjoy ... and thanks for spending your 30 seconds with Scott!